PARIS, /PRNewswire/ -- Cardiologs, a medtech company transforming cardiac diagnostics using medical-grade artificial intelligence (AI) and cloud technology, announced today that co-founder and CEO, Yann Fleureau, has been named one of MIT Technology Review's Innovators Under 35 Europe 2018. He was honored during an award ceremony in Paris on December 4, 2018. Additionally, Yann Fleureau has been selected among the 35 laureates as BNP Paribas European Innovator of the Year. Selected from a pool of more than 1,000 candidates, the 35 innovators were awarded as part of a community of leaders that are changing the future of technology. Yann was specifically recognized for revolutionizing cardiac care through his work developing a cloud-based AI platform that can quickly and accurately analyze electrocardiograms (ECGs). "I'm deeply honored to be selected to receive this prestigious award and am humbled to be included among the many talented innovators who are using technology to benefit humankind," said Yann. "This technology not only improves cardiac diagnostic efficiency and analysis of ECGs, but also democratizes access to make expert cardiac diagnostics more available in developing countries and emerging markets. I'm proud of the work our team has done. We're excited to build on this recognition and continue to extend our solution's reach and data collection to serve a greater community of doctors and patients." Cardiologs' technology, which can be universally accessible from any device, supports doctors by helping identify patterns and predict irregularities the heart's electrical activity – empowering physicians to better diagnose and address patients' heart conditions. It's the first commercially available algorithm for analyzing ECGs based on deep learning technology, and among only a few AI solutions to have received regulatory clearance for clinical use. The system is currently CE-Marked in Europe and has received FDA clearance to aid physicians in screening for arrhythmias such as atrial fibrillation using ambulatory ECG recordings. The solution is now in clinical use across four continents. 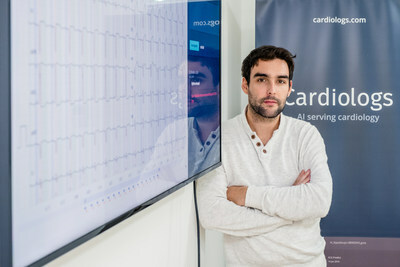 "With Cardiologs and their use of AI in cardiac diagnostics, Yann Fleureau proposes a technological revolution in a tool that has been used in clinical practice for many years, but whose potential is now growing exponentially with the availability of new devices capable of recording ECGs," said Innovators Under 35 Europe's organizing team. "With Cardiologs, we now have a scaleable expert analysis solution that can help make sense of this new flow of valuable clinical information and can form a key building block in the medicine of the future." Cardiologs is a medical technology company committed to transforming cardiac diagnostics using medical-grade artificial intelligence and cloud technology. Developed in partnership with leading physicians, the Cardiologs ECG Analysis Solution empowers clinicians worldwide to deliver expert cardiac care faster and more efficiently. CE-Marked and FDA cleared for detection of 14 cardiac arrhythmias, the Cardiologs ECG Analysis Solution is built on a growing database of more than 600,000 ECG recordings and is supported by a number of clinical publications.